Did a Field Trip Put Students in the Lion’s Den? Whose Truth Should They Hear? Introduction: This guide includes a summary of each part of Faith Ed, discussion questions, and links and suggestions for further reading. Teachers can use it on their own or in groups with colleagues. Try the questions below as a starting off point to assess your own knowledge about religion’s role in public schools and your comfort level with teaching about religion. All teachers, whether they teach in a private or public school, need to think about how they can provide balanced lessons on the world’s religions. Those in private schools, however, have fewer restrictions since they are not beholden to rules on separation of church and state. My commentary: How Schools Overlook Religious Harassment, for Religion News Service. PBS Newshour special on Somalian Muslim immigrants in Minnesota. First Amendment Center article on teaching about religion. Summary: Lumberton, Texas teacher Sharon Peters had taught the same lesson for 15 years in her advanced world geography class for freshmen. She often brought in clothing from different countries for students to try on. She also incorporated lessons about Christianity, Judaism and Islam where such instruction made sense. No one complained until 2013 when a student took a photo of five teens trying on clothing from Muslim-majority countries, including a burka. The photo was posted on Facebook, and it went viral. Peters, who had taught for 39 years, soon faced vitriol from a few parents and mostly from hundreds of strangers outside of Lumberton. She was accused of promoting oppression of women and indoctrinating students in Islam. The school system supported her, but Peters retired early because of the furor. News story on calligraphy lesson controversy in Virginia. My commentary on the calligraphy controversy. My commentary on World Hijab Day activities in schools. American Academy of Religion “Guidelines for Teaching about Religion in K-12 Schools”. News story on Colorado school system controversy. News story on Tennessee field trip brouhaha. Summary: In 2012, protestors streamed to the Hillsborough County School Board meetings in Tampa to object to a guest speaker on Islam at Steinbrenner High School. In the fall of 2011, the speaker, Hassan Shibly, had spoken to several world history and one world religion class about the basics of Islam. Shibly is an imam and executive director of CAIR-Florida, a Muslim civil rights organization. He was one of several guest speakers that teacher Kelly Miliziano invited each year to supplement instruction about the world’s religions as part of world history. First Amendment Center’s “A Teacher’s Guide to Religion in the Public Schools”. Summary: Teachers at Minneha Core Knowledge Elementary School in Wichita, Kansas, have taught about the world religions as early as first grade since the late 1990s. They use the Core Knowledge curriculum, created by E.D. Hirsch, an education researcher. Minneha had a controversy in 2013 when a parent took a photo of a yet-to-be-filled bulletin board. All it said was “Five Pillars of Islam,” but the parent thought the bulletin board should have a sixth pillar, jihad, which she contended was the demand for Muslims to kill all non-Muslims. Her photo, which she shared with a state lawmaker with similar views, went viral and became national news. The main objection was that a school was teaching about religion, particularly Islam, to such young students. Opponents expressed Islamophobia but also questioned how teachers could teach about religion to such young students. First-graders were getting introductory information about Judaism, Christianity, and Islam. Second-graders learned about Hinduism. Fourth-graders studied the spread of Islam. How can schools deal with parents’ concerns? Parents who have no religion in the home worry that such lessons may upset their children and cause discomfort. Others worry about their children learning conflicting values to their own faith. How can you teach? My commentary on handling the Christmas dilemma in public schools. First Amendment center article on religious holidays and schools. Debate over Georgia’s standard on Christmas instruction in kindergarten. In 1974, when the author moved to northwest Ohio in fourth grade, she felt different for the first time in her life as one of the only Jews, other than her brothers, in the Van Buren school system. Making matters worse, the school system allowed a woman hired by a local church to come into elementary classrooms every week and teach Bible stories and lead the children in praise songs about Jesus. The author was excused, but the experience singled her out because she was the only one who left each week. This was clearly preaching religion in the public schools. In 2013, the author returned to see if the school was doing a better job of heeding the lines separating church and state. She found a mixed bag, even as Van Buren embraced the state standard to teach middle schoolers about the world’s religions. A youth pastor regularly visited the lunch room recruiting students for weekly meetings. There was a new religious club, God’s Knights, that met during the lunch hour. The principal sometimes visited and read scripture. First Amendment Center’s article on religious clubs. Summary: Modesto, California, in 2000 became the only school system in the country to require all high school freshmen to take a world’s religions course before graduation. This chapter takes readers to a Modesto teacher’s classroom and gives a taste of the course and its effect on students. Modesto has never encountered controversy for its religions course. It prohibits the use of guest speakers; field trips; trying on ritual garb; and heavy discussion on religion in the classroom. Teachers have gone through training and visited houses of worship to prepare for the course. They also receiving coaching on what the First Amendment says as well. Research has shown that Modesto students learn to stand up for others through the course and retain some, but not all, of what they’re taught about the basics of a minimum of six religions. In Modesto’s case, the school system requires that Sikhism is taught, given the large Sikh population in California. 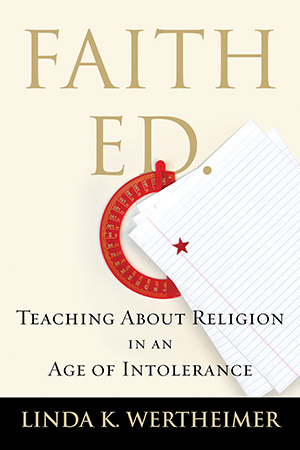 Article in Teaching Tolerance magazine about Modesto and teaching about religion. CBS Evening News special in 2008 on Modesto’s course. Book: Teaching about Religions, a Democratic Approach by researcher Emile Lester, who surveyed Modesto students on what they learned. Published in 2011 by University of Michigan Press. The Pluralism Project at Harvard University: Numerous resources on world religions. Religious Literacy and God is Not One, books by religion scholar Stephen Prothero, based at Boston University. The National Council for the Social Studies position paper on studying religions in the curriculum. For more information on national standards, go to: http://www.socialstudies.org/standards/.